Stanford University rafts the Grand Canyon for college credit. Photo by Lauren Oakes. Organizing a Grand Canyon private group charter raft expedition with friends, family, co-workers or for an organization is a lot of fun. It is also a lot of work! Nevertheless, if you put in the effort to plan a Grand Canyon private group charter, the effort will pay off in the end. 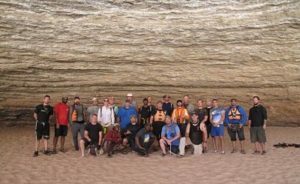 A Grand Canyon private group charter raft trip fosters camaraderie, teamwork and communication. This adventure offers lifelong learning opportunities and invokes a sense of adventure in all who partake. Above all else, you are in one of the most beautiful places on earth with people you care about. However, it is a big task to pull together a group of people who have the time, the money and the ability to commit far in advance. Here is a guide on how to get organized, what to expect and tips. Make your Grand Canyon private group charter a reality when you choose to raft with an experienced, licensed and knowledgeable outfitter like Arizona Raft Adventures. It is the ultimate adventure to raft the Colorado River through the Grand Canyon. So learn all you can about what it entails. It is not an expedition for everyone and it is important that the adventure is a good fit for you and your group. It is very important for you to KNOW YOUR GROUP when you begin planning. There are different types of raft adventures. You may have to choose one that best accommodates the person in your group with the least ability. Or possibly narrow down your invitation list. This is particularly important if the expedition involves a hike on the Bright Angel Trail. If you get stumped during this part of the process, it is crucial that you reach out to a knowledgeable reservation staff person to discuss your concerns and options. Rocky Mountain PBS organized a group charter trip. Photo submitted by Aaron Hoffman. 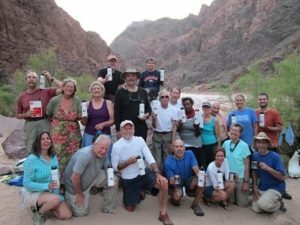 There are a couple of strategies to take when you pick a date for your Grand Canyon private group charter. If you are specific in your date needs, then you may need to plan TWO YEARS IN ADVANCE. Grand Canyon outfitters have a limited schedule and dates are mandated by the National Park Service. The second approach is to call and see what is available (1-800-786-7238). It is entirely possible that there is a date open and available the next season or even that season too! You never know so it may be useful to call if you are flexible with date possibilities. Once you pick out your adventure type and find an available date, it is time to secure your reservation. Arizona Raft Adventures works with you when it is time to secure a reservation for your Grand Canyon private group charter. But ultimately, deposit money is what holds your date. Family and friends on a Grand Canyon private group charter trip play in waterfall. Photo submitted by Larry Linder. Option One. Pay the deposit money yourself. This can be very helpful if you have no idea who will come on the expedition just yet or if you are an organization that will fill the adventure at a later time. The disadvantage of paying the deposit yourself is the extreme financial penalty that you personally incur if your group does not come together as planned. This happens with some frequency. In the beginning everyone is overly excited about the idea, but when it comes time to commit and pay money to the group organizer, potential participants drop like flies. It is a lot of financial stress on the planner. The second strategy is to ask your group to call and make their own reservation. It is reasonable for an outfitter to hold a trip date for 10 days. During this time, instruct your group to make their own reservations. The advantage of this approach is that your group participants deal directly with Arizona Raft Adventures. They make their own payment and get their own invoice and receipt. They receive paperwork and other reservation information directly. The disadvantage to having your group members deal directly with the outfitter is that you lose a little control over the registration process. It is also more difficult to keep track of cancellations as group members discover they are unable to attend at a later date. As the group organizer, you may like to help your participants prepare too. Send gentle email reminders to your group reminding them to read the information provided, encourage them to start or maintain a physical fitness program and help answer questions they might have. At the least, encourage your participants to take an active role in their own preparations. Wounded Warriors chooses Arizona Raft Adventures for a Grand Canyon private group charter. No one ever puts down deposit money on a vacation like this with a plan to cancel. Encourage your participants to purchase trip cancellation insurance to protect themselves from unforeseen reasons that might cause them to cancel down the road. You might also want to keep a personal waiting list to refill spaces if you have anyone cancel. If your group members cancel, your numbers might fall below the minimum number needed to keep your adventure a private group. The hard part is done now! Go…relax and enjoy. Let Arizona Raft Adventures do the rest. The guides will provide a memorable experience! Don’t forget to take a group photo! Post trip dinner at Charly’s Pub and Grill in Flagstaff. Photo by Mac McKeever. 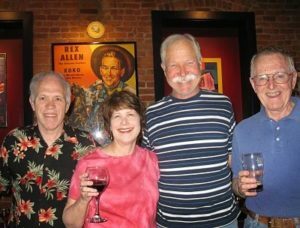 Some group organizers like to plan a couple things for after their Grand Canyon group charter expedition too. One very popular activity is to have dinner together the last evening after you return to town. Your guides will likely have suggestions. It’s a great finale to what has been an excellent adventure. Some group members like to facilitate and encourage photo sharing. 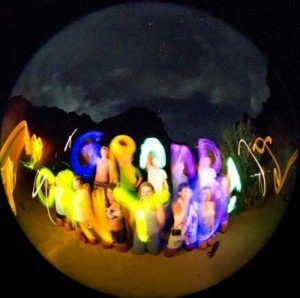 Arizona Raft Adventures has made that very easy for groups using the online portfolios to interact with other participants and guides. You may be surprised to hear how many groups come back time and again. Whatever frequency fits the desire of your group, begin to plan the next expedition as soon as possible! Every adventure is a little different from the last – different guides, weather, hikes and group dynamics. All the ingredients needed to make another amazing Grand Canyon private group charter trip! Sign up to receive an email notification when a new article is posted on the AzRA blog. Safe and secure signup provided by Constant Contact. I never knew that you need to plan your grand canyon tour as much as two years in advance. This kind of timeline would give you plenty of time to plan your trip. My sister and I have always wanted to tour the grand canyon, so we’ll have to start planning our trip now. We would love to help you plan your adventure. Please feel free to give us a call 1-800-786-7238. I’d like to do a private raft trip for my family, but the youngest will be 7 next year. Is the 10 age requirement for private adventures too? And if so, how many years in advance can we book? Hi Priscilla, thank you for your comment! We do still request that the youngest member of the party is close to our minimum age. We will have a conversation with you if you fill the whole trip (as you had mentioned you were interested in) to make an exception, however, we would still prefer the child to be closer to 9. That’s for our motor adventure, too. Our Classic Adventures would be a minimum age of 12 (or for a charter, we’d chat about an 11 year old). We’re currently taking reservations for the 2020 season, and started reserving charters for the 2020 season in November of last year. If you wanted to move forward with a motor charter, and for your youngest to be 9, you’d want to reserve to raft with us in 2022, so you would want to join our charter interest list for the 2022 season. Contact our office soon so we can add you to that interest list and chat with you about charter expectations. We look forward to talking to you! BBQ Chicken Recipe and Its Sides! © Arizona Raft Adventures Grand Canyon. All Rights Reserved.